Virtual reality is a very powerful and compelling computer application by which humans can interface and interact with computer-generated environments in a way that mimics real life and engages all the senses. Although its most widely known application is in the entertainment industry, the real promise of virtual reality lies in such fields as medicine, engineering, oil exploration and the military, to name just a few. Through virtual reality scientists can triple the rate of oil discovery, pilots can dogfight numerically-superior "bandits," and surgeons can improve their skills on virtual (rather than real) patients. 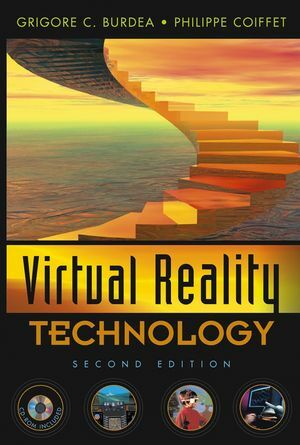 The new edition of Virtual Reality Technology is specifically designed for use as a textbook. Thus it includes definitions, review questions, and a Laboratory Manual with homework and programming assignments. The accompanying CD-ROM also contains video clips that reinforce the topics covered in the textbook. The Second Edition will serve as a state-of-the-art resource for both graduate and undergraduate students in engineering, computer science, and other disciplines. GRIGORE C. BURDEA is a professor at Rutgers-the State University of New Jersey, and author of the book Force and Touch Feedback for Virtual Reality, also published by Wiley. PHILIPPE COIFFET is a Director of Research at CNRS (French National Scientific Research Center) and Member of the National Academy of Technologies of France. He authored 20 books on Robotics and VR translated into several languages. GRIGORE C. BURDEA is a professor at Rutgers, the State University of New Jersey, and author of the book Force and Touch Feedback for Virtual Reality, also published by Wiley. PHILIPPE COIFFET is a Director of Research at CNRS (French National Scientific Research Center) and Member of the National Academy of Technologies of France. He has authored twenty books on robotics and virtual reality, which have been translated into several languages.